تمنایی, مینا, طباطبائیان, مریم. (1394). زیباشناسی سد و اعتلای منظر. مجله علمی-ترویجی منظر, 7(30), 14-21. مینا تمنایی; مریم طباطبائیان. "زیباشناسی سد و اعتلای منظر". 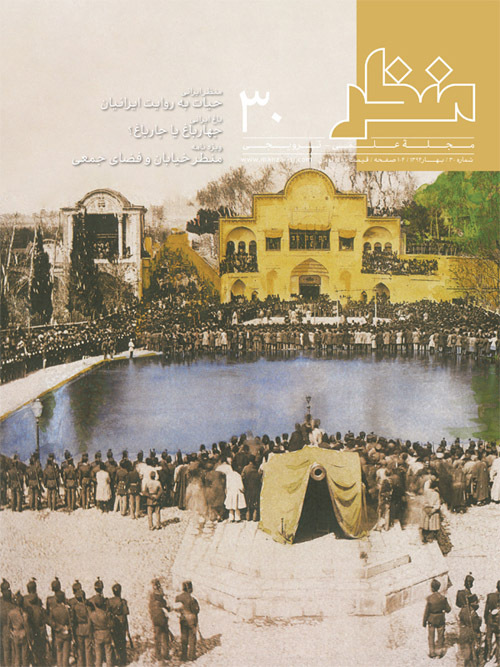 مجله علمی-ترویجی منظر, 7, 30, 1394, 14-21. تمنایی, مینا, طباطبائیان, مریم. (1394). 'زیباشناسی سد و اعتلای منظر', مجله علمی-ترویجی منظر, 7(30), pp. 14-21. تمنایی, مینا, طباطبائیان, مریم. زیباشناسی سد و اعتلای منظر. مجله علمی-ترویجی منظر, 1394; 7(30): 14-21. فرآیند طراحی و ساخت یک سد ایمن و کارآمد، تلاشی مداوم جهت برخوردهایی درست و اقتصادی با چالش‌هایی مرتبط با زمین‌شناسی، هیدرولوژی و مصالح است. در کنار تحصیل این مطالبات بنیادین، دست‌یابی به زیبایی سد و ارتباط مطلوب میان طرح سد و محیط اطراف آن، ابعاد دیگری است که باید به آن توجه شود. سد به‌عنوان عنصری مداخله‌گر در طبیعت که گستره وسیعی از طبیعت را دستخوش تغییر می‌نماید، ضروری است نه‌تنها زیبایی طبیعت را مخدوش ننموده، بلکه آن را نیز ارتقا بخشد. به دلیل تأثیر مستقیم مشاهده و ارتباط با طبیعت بر سلامت روانی انسان، درصورتی‌که ساخت سد به تضعیف یا نابودی مناظر زیبای طبیعت منجر شود، سلامت روانی انسان نیز به‌ مرور زمان در معرض تهدید قرار خواهد گرفت. در صورت لحاظ ‌نمودن این دیدگاه در طراحی، نتایج، اغلب چشمگیر است و سازه‌هایی باهیبت و زیبا پدید می‌آید که قادر است کیفیت زیباشناختی محیط طبیعی اطراف خود را تقویت سازد. عوامل اصلی پدیدآورنده زیبایی در معماری سدها و به دنبال آن حفظ و ارتقای منظر، موضوع اصلی این مقاله است. مطالعات نشان می‌دهد اعتلای زیبایی سدها با رعایت اصولی ازجمله نظم، تناسبات، ارتباط مطلوب با محیط و نیز دارابودن عملکرد مناسب، همزمان با پاسخگویی درخور به نیازهای تکنیکی سد قابل حصول خواهد بود. Safety and functionality of dams during the long operating life usually provides a dominant controlling role for the criteria raised by nature and economy such as geology, hydrology, and material availability. Having met these fundamental demands, the question of achieving elegance and harmony with the surrounding environment brings up another probably never less important. Dams as giant elements interfering the nature have to be designed not to reduce the beauty of nature, even to improve it as well. Main factors creating beauty in dams’ architecture and the harmony with its natural surroundings, is the main subject of this article. The hypothesis states that although the mentioned dominant controlling roles of economy, structural stability and functionality provide some constraints in designing dams aesthetically, the enhancement of the aesthetics of dams and consequently the aesthetics of its natural environment are definitely achievable by considering principles such as order, proportionality, appropriate interaction with environment, and also functionality. The research method of this study is based on the content analysis of theoretical research and examination of the new findings in the context of aesthetic, architectural design and landscape design. Data collection has been through library studies and a literature review. Order is one important aesthetic prerequisite. Formal principals of architecture serve to define the order inherent in the structure and its relationship with the environment. The attempt in dam engineering to enhance aesthetic through order involves three elements: repetition, parallelism and orthogonality. First, order manifests itself by repetition and parallelism of simple, formally similar elements. Second, orthogonality constitutes another element of architectural order. In most dams, the appurtenant structures are incorporated in the dam body. Whether such structures are or are not arrange orthogonally influences the overall aesthetic impression of the dam. In curved dams, orthogonality as an element of order is replaced by the structures being oriented towards on central focal point. A structure which is unable to tell us if it is perpendicular or not, if it is symmetric or not, if it is straight or curved, may strain our sense of order. Another formal principal in architecture is proportionality. Highly tensioned and slender structures are perceived as elegant and aesthetically pleasing. Slenderness manifests itself to the extent of the allowed stress level; the higher the tensile level, the thinner the element becomes and the more elegant the structure appears. Environment considerations are particularly relevant for dams, as their enormous dimensions affect nature. For some, stark contras may be undesirable, because it clashes with nature’s own inherent beauty. For others, contrast is the honest and only possible expression of technical creativity. Besides a dam’s physical structure, the consequences of construction and damming also have aesthetic implication. The relics of construction and empty reservoirs with their muddy shore lines are unappealing. By contrast, there is the dam’s full reservoir with all its ecological and aesthetic merits.